Here at the Group Real Estate, a small time brokerage, in Idaho Falls, doing big things, selling homes for sale in Idaho Falls, we love to talk about nerdy things. We love to engage in the main conversations that all nerds have. Some are about the notions of having Star Wars talk and why we love Empire Strikes Back the most, why we want to make sure that no one could truly best Captain America in combat and what new Netflix show from Marvel is winning our hearts of late. Marvel may have brought us the best thing that have ever done, thus far, from the Netflix run of series’. In this year, we have had three different Marvel series, one being the absolutely terrible Iron Fist, the other being the pretty good The Defenders series (which brought together all the heroes we have come to love over the last four years, in Daredevil, Jessica Jones, Luke Cage and Iron Fist). The final one, is this last weekend’s The Punisher. Punisher was introduced to us in the second season of Daredevil. None of the shows have hit that same mode and feeling that the first season of Daredevil did, though the other series’ have been real amazing on their own, especially Jessica Jones and Luke Cage. The second season of Daredevil was great, not as good as the first, but the one thing they wholly got right was their portrayal, and casting, of The Punisher. Jon Bernthal is a revelation as the character. 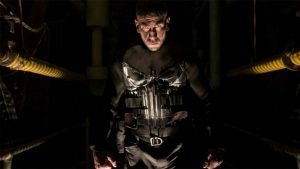 The reason we even got this first season of Punisher was due to the success of how he was received in the second season of Daredevil. When I heard news he was getting his own series, I was elated. This was something that I truly wanted and was glad to know was happening. And here it is. And my goodness it is truly something to behold. Jon Bernthal brings to us an unreal performance. I love Charlie Cox as Matt Murdock/Daredevil and Krysten Ritter as Jessica Jones, but this is the best performance by any of the actors in these shows. He brings such ferocity to the show that you can’t help but have true adrenaline spikes when you behold the action scenes in this show. Jon Bernthal was born to play this character. And anyone who has truly read the comics, loves the character and embraces who is, would never argue that statement. There are some action scenes that are almost too hard to take in, with its sheer brutality, its ferocious nature, and R rated feel, the action scenes, especially when Bernthal is in them, are done with the way a true scene would go. There is fear, there is anger, there is adrenaline. Amidst all the training, we get to see such a humanistic quality about these. As awesome as the scenes in Daredevil are, they are very superhero, to some degree, and especially in comparison to these ones. Do yourself a favor and watch this series. If you haven’t seen the other ones, that is all right. I can’t say too much, other than how much you will get into the tortured soul that Bernthal brings to the screen. The character work in this is the best I have seen in any series. Especially him. Sadly, that may be it’s one and only blight. The idea that he is so, so good in this, when he isn’t on screen, it’s not that it is bad, because it is still good and the actors are very good, but it truly makes you want to have him on screen again as soon as possible. I can’t say it enough, Bernthal is electric in this role and I fully believe it needs to be the first of the Marvel series for Netflix that lands a Golden Globe nod or an Emmy nod. He is that good. The series is exceptional. And with people freaking out about how it shouldn’t be out in a time like we are living in today’s world, they are the exact opposite here, as it is truly important to have series’ like this in the world that we live in today. 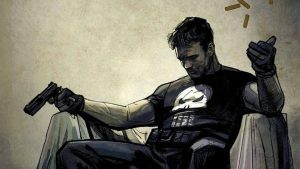 There is whole merit to what Punisher does, and even more so to who he is as Frank Castle. Do yourself a favor and check this one out.